Over the past couple weeks, I’ve been cultivating a lovely little indoor garden of long-stem Piranha Plants. 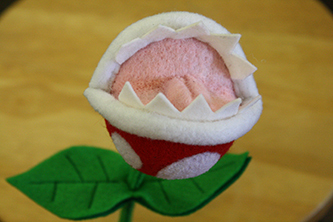 Today I thought I’d let you see a little of what goes into “growing” a long-stem Piranha Plant. They spring up quickly, but they do require a fair bit of development! All those teeth don’t just appear out of nowhere, after all. These fellows will all be for sale this weekend at UVic’s Games Without Frontiers, which I’ll discuss along in the post. 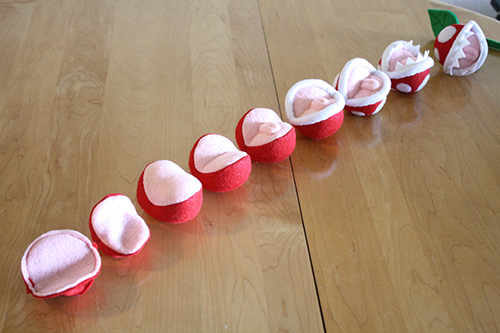 Next week we’ll get back to some craft tutorial, but for now, enjoy this brief and hiiiiighly scientific examination of the growth process of the long-stem felt Piranha Plant of the Pacific Northwest. 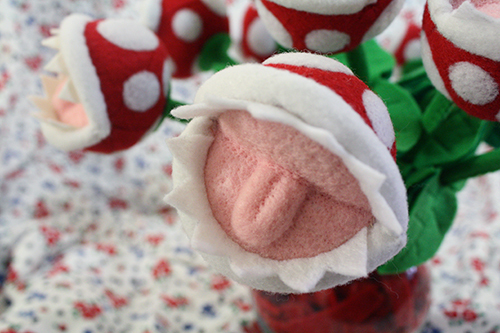 You can also often find a Piranha Plant or two in my Etsy store. 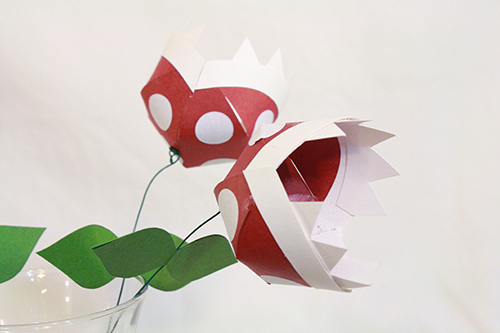 EDIT: Since this post, I’ve posted a new Piranha Plant project you can try out yourself: make 3D paper Piranha Plant flowers! 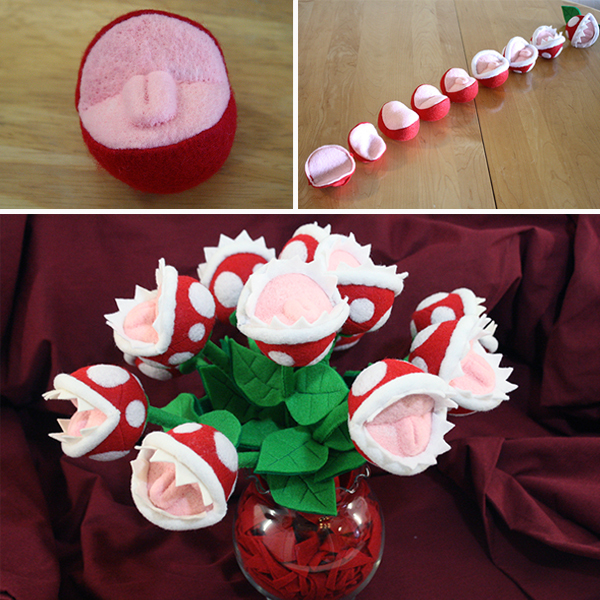 Piranha Plants begin with several segments, like orange slices, to form most but not all of a sphere. 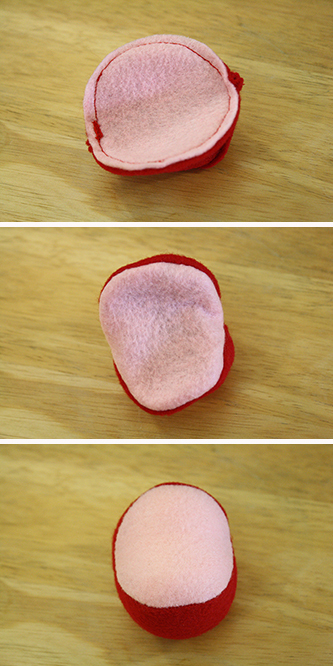 Almost exactly like making felt pigs, but with a chunk missing. That chunk is replaced with a slightly elongated circle for the mouth. 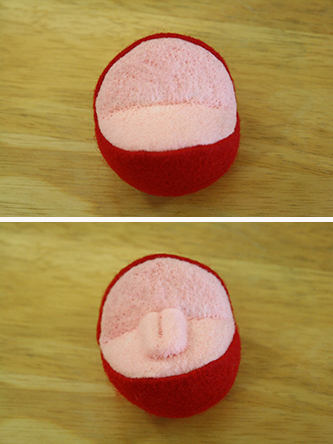 It’s all stitched together, with an opening left in the bottom, and then turned right side out and stuffed. After that, the needle felting begins, to give the plant the right shape, instead of just being a pink and red blobbish mess. 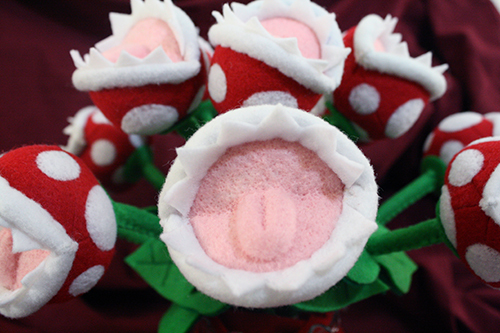 And of course it needs a tongue, so it can enjoy the taste of stray fingers while it mutilates them. 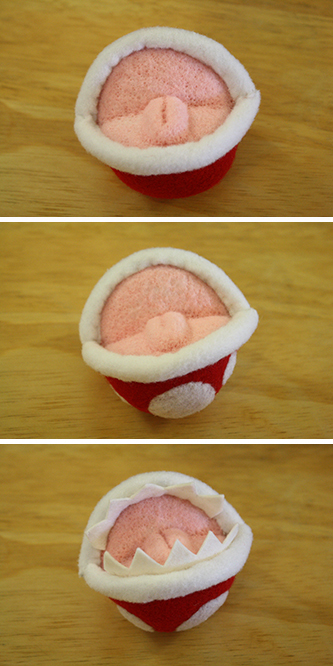 After that, the lips are stitched on, and more needle felting follows to add the white spots to the bulb of the flower. Then the teeth grow in! And finally, it gets a stem and some handsome green leaves. Now it’s all ready to go out into the world and chomp whatever it can reach! And that is how I like to do my gardening. 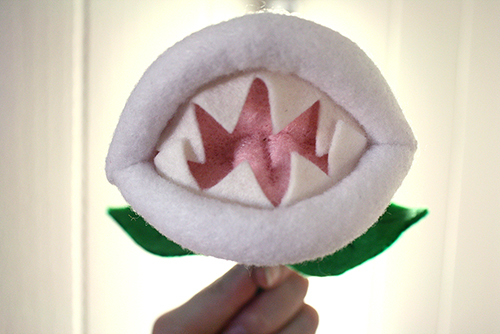 I’ll be selling these Piranha Plants this Saturday at UVic, as well as showing off various other game-related plushies and giving people a chance to try a bit of needle felting for themselves. I’m taking part in a new event called Games Without Frontiers, put on as part of UVic’s IdeaFest. It will be a day-long exploration of the social power and uses of video games, with panels, presentations and demos by local designers and games industry specialists. I’ll also be giving a talk, along with Kathleen deVere of LoadingReadyRun, about Desert Bus for Hope, and how it uses video games and game culture to raise money for charity. You can find out more about the event via the link in the previous paragraph, and see the full day’s schedule of events here. I hope to see some of you there! Just watch your fingers if you come by my table. 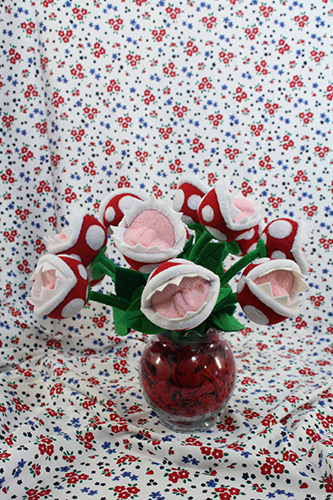 Piranha Plants are always hungry. Now I don’t have any excuse to not make mine! I don’t really understand how you get the fold in your Piranha Plant… What I’m asking is, in your one-image recap of the full “growth” cycle, how do you get to stage 4 from 3? Ah yes! These are so awesome! Please clarify how you get the fold and the “needling felting”. Can I use the polyester fiberfill for the lips or is it better to use felt bits? Did you use any stuffing at all for the lips and tongue or is it possible to needle felt the 3D effect without stuffing for those details?